Christmas time for Mia and me is about family, hot weather, turkey and panettone! Yes, since many years ago, we are spending the Christmas season in Peru. Unfortunately this time we were forced to postpone our trip till the end of December, arriving to Lima just before New Year’s eve. Our routine during the first days in Peru is nothing pretendious, just enjoying the presence of my parents and other family members, walking on the neighbourhood and appreciating the warm shiny days that have been neglected to us for so many months. This is magic! On the second week of January we travelled to Cajamarca. This is a region located in the North of Peru which has become the main coffee producing region in Peru. Coffees of Cajamarca are also occupying most of the top places in National competitions, such as the Cup of Excellence. 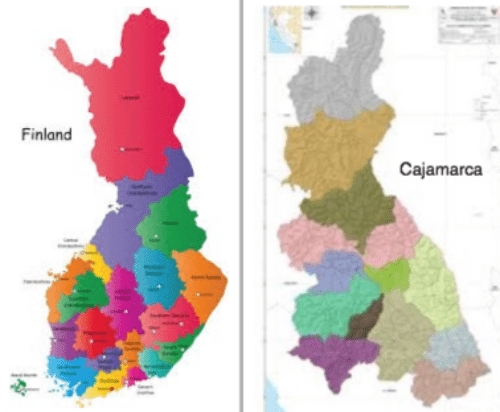 One thing that came to my attention is peculiar similarities between the shape of the Cajamarca region and Finland. Surely this was the preamble of the strong connections between Cajamarca and Finland that we were going to have. I have been many times in Cajamarca but only on the highlands (Sierra). This time we travelled to Jaen which is located in the jungle side of Cajamarca. I was very impressed about how beautiful and different the jungles here are compared to other jungles such as from Chanchamayo (where our coffee Gran Palomar comes from) or from Amazonas. The jungles in Jaen are not wild, you do not see the typical muddy rivers or the exotic wild plants growing everywhere on the hills, like in other jungles. Rather, the vegetation here looks like carefully spread across the mountains, in a more aesthetic way. With the exception of the hot weather I would consider these scenarios more alike to the Highlands of Peru than rather a typical jungle geography. We spent the following days visiting some coffee producers and their farms. Reaching them required driving through narrow trails. Javier Saucedo, from San Jose del Alto, was the first producer that we met. We tasted a sample of his organic coffee on December and now we are meeting him in person! He warmly welcome us to his house and showed us the nice arrays of drying tables that he built to dry his coffee. He is a young father that is open to learn new techniques to improve the quality of his coffee. Building such a drying plant is not something very common between Peruvian producers because, as a small farmer, this requires considerable investment that many producers cannot afford or just do not feel like doing. So I certainly believe Javier Saucedo is a very professional farmer who we will be very proud to work with. His farm is located at 1800 masl and cultivates the caturra variety. His coffee taste amazing with clear notes of caramel and strawberry! We visited also the Rimachin family in the same area. He cultivates Yellow Caturra and Typica. Her wife and Mia stayed in the house while the rest of us went to inspect the coffee plantations. His son dream to become an Agricultural engineer and with his education he will certainly support the family business. Back in Jaen, the following morning we met some producers whose coffee was chosen as one of the winners of the Cup of Excellence in previous years. Although we agreed to meet at a Café nearby the main square, we decided to go to the artisan market and eat some typical street food. As a natural born foodie, I so much enjoy these kind of cozy experiences! After breakfast Juan managed to convince us to visit his farm located in Huabal and stay the night in his house. We then rented a car and drove up more than 1000 meters, arriving to his town after 2.5 hours. Juan’s farm is located in a sort of wide “Quebrada” (ravine) with picturesques little towns on the other side of the river. We are at 1800 masl and the weather is quite pleasant. Juan told us that this region is always green during the year and has a sort of hybrid geography between the highlands and the jungles. Here people cultivate coffee but also other vegetables which are atypical from the jungles, like potato, carrot, broad beans, you name it! It was also clearly seen how passionate Juan is about his cultivars, how enthusiastic he wanted to show us his farm and how proudly shows his beautiful coffee trees. After spending some good time playing football and talking about life, he proposed us to become the Godparents of his two youngest children. We accepted gladly and, following a traditional from that region, we ended up cutting the hairs of our godsons! Cutting the hair to our Godson! Certainly I would have enjoyed to stay more days with Juan but needed to depart the next day back to Lima, being there with our family and getting ready for our trip back to Finland. Now that I am writing this blog and thinking about the current coffee crisis that we are experimenting at this moment (coffee prices are currently bordering the 1 dollar per kilo), I am feeling proud to myself and to our company Cafetoria of the fact that we are not taking advantage of this crisis as we are fully commitment to ethical trade and long term cooperation with small producers. We are going to stay in our commitment to value the cost of their efforts on cultivating high quality coffees. As long as they put effort on cultivating high quality coffees our prices will not go down but rather up. We are valuing their work by paying more than 6 times the current international prices and believing in a quality coffee and a high quality cooperation. From this great trip to Cajamarca, our experience in Huabal was for us the most exciting one. We did not only agree to buy Juan’s fabulous coffee this year but we also created a strong family relationship with him and his family. Together with the beautiful geography of Huabal, we believe this place will become something very special for us and who knows, we may end up living here for large periods! The Baptism of his children and the party will be on June, so one more reason to come back to Peru this year! What a most interesting blog, thank you Juanca. Now I am looking forward to get a chance to experience the tastes from Juan’s farm enriched trough your barista/roasting skills. It will certainly be a good completition to Cafetoria’s already excellent variority of top coffie brands. Let me know when the hings are that far. See you in Töölö or Lohja soon. Thanks you for taking time to write Erkki! We are also excited about this cooperation with Juan. More reasons to return to Peru this year! 🙂 While we wait for Juan’s coffee we will have in few days a coffee from a Las Cortaderas farm, located quite close to Juan’s. This coffee is was chosen the 30th Best Peruvian coffee last year at the Cup of Excellence competition! Thanks for following us and your company all this time!